My last blog on this disaster I attempted to focus on what would possibly happen to the sea-life in the ocean surrounding Fukushima and beyond. Finally, we have a little peak at what is happening though the details neglect to include any specific mention of impact on living things. Further that the plant operator, TEPCO, has been responsible for collecting and submitting this data. At this point it seems that an international organization should be involved as at least a second party to verify collection procedures and data collected. I for one have very little confidence in anything submitted by either this company or the Japanese government. It is unclear as to the total times bottom samples have been taken since March 11, but this is the first time radioactive samples have been detected in bottom samples. These findings have been consistent at both the 9 mile and 12 mile distance into the ocean from the nuclear reactors. Previously I was unsure of the actual sea depth but noting that in all cases it was less then 100 feet is most alarming. The sea-floor at these shallow depths is that countries ocean food basket. At this time of year biological activity should be at a maximum as it is here off the coast of Oregon. Again I will include my new favorite living thing, Prochlorcoccus, part bacteria part plant, that provides up to 50% of all ocean produced oxygen. Why is it mentioned, it is the driving force for element uptake from bottom sediments and the transmission to higher forms which include phytoplankton, brown algae, as well as krill and up the food chain. Although no mention has been made of whales, baleen whales are almost totally dependent on krill while all other whales are at-least partially dependent as intermediate food for various fish types. Oh, as of last Friday when these samples were collected based what has been released to the public these levels are only 600 times what had previously been considered within safe limits. Recently two secretaries of state met, one from our country and one from Japan. They both pledge to support the continued sales and consumption of fish and products originating from Japanese waters. Based on this new information, is it not time to reconsider this hand shake? This entry was posted in Cetaceans and tagged Fukushima, Japan, nuclear power, radioactive fallout by Kirsten Massebeau. Bookmark the permalink. YOU SEEM TO BE THE PROPER CONTACTS FOR MY QUESTIONS. A TSUNAMI IS SUPPOSED TO REMOVE ABOUT A FOOT OF SEDIMENT FOR EACH 7 FEET OF WAVE HEIGHT WHICH MEANS ABOUT 7 FEET FOR THE FUKASHIMA WAVE. WHERE CAN i FIND THE IMPACT ON THE MARINE ECOLOGY? WHAT HAS BEEN THE IMPACT ON COASTAL FISHERIES? Carl I We are honored that you have ddrectedyour commment to us regarding your question on erosion associated with a tsunami. I have made a quick internet search and can find no direct information to substantiate your claim that one ft. of erosion will occur for every 7 ft of wave height. I live in Oregon and our state university Oregon State University School of Oceanography has a wave lab which models tsunami waves and what happens at coastal locations. They recreated what might happen to our town, Cannon Beach. I do not have a copy of that information but it is available for sure. I will give you the information for OSU School of Oceanography, http://www.oce.orst.edu/index.cfm?fuseaction=content.search#. Also will pass your question on to our local geologist Tom Horning a person very knowledgeable on this entire topic and will be a excellent resource for your question. He is on Face Book and may respond to your inquirery. I wich you luck in this pursuit and thanks again for asking us this question. I am unfamiliar with the claim that one foot of erosion will occur for every seven feet of water depth. I think it must have been taken out of context. Water depth does not control erosion. Water velocity does. However, many factors affect the ability of the water to move sediments- water velocity, sediment size, surface roughness, and vegetation mats, to name a few; plus tsunami flow duration, turbulence vs laminar flow, and sand transport style (complicated relationships of sand flow, saltation (bouncing), and turbulent suspension). I have seen diagrams approximating this in hydrodynamic engineering, and I know that Bruce Jaffe, USGS Santa Cruz, has been researching this for his modeling work. I wish I could find that diagram! In a book by Ed Bryant, “Tsunami- The Underrated Hazard”, examples of modern tsunami deposits are provided, and studies of deposits that have been interpreted as dumped by tsunamis have been described. In the latter case, boulder and beds can be laid down by tsunamis, and that means that they have been transported. Around Seaside, we can find where small boulders have been rolled off of gravel ridges and into peat beds. Certainly, sand is easily transported, as it is characteristically laid down by the waves. In my experience as a witness to the 1964 tsunami in Seaside, evidence of 2 ft of erosion in 8 ft of water was fairly limited, with most observable scour depressions occurring where water swirled around shoreline projections, most likely accelerating sand removal by vortex currents. Very likely, sand was picked up from the river channel bottoms, where observations of changes were hidden. Overall, however, where water flowed at least several feet deep over vegetated land, no erosion occurred at all. There are so many variables in the erosion process, a rule of thumb just doesn’t seem to apply. I hope this helps. Certainly, I doubt if much can be made of the Fukushima situation without a site-specific investigation. Great job Ed! 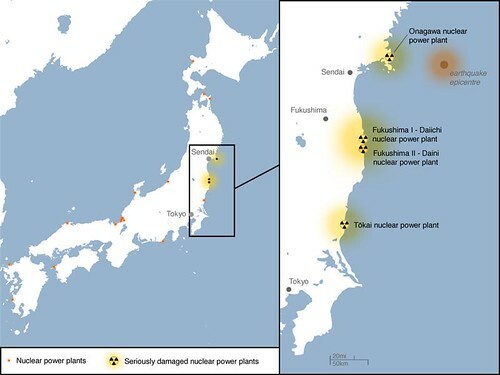 I think when and important issue like the failing reactor at Fukushima disappears from the news it’s easy to forget that the radiation is there, and it is killing people, the ocean, ocean life, everything within it’s reach. Please stay after this one will you Ed. It is so important.